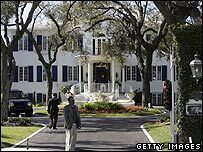 Tony Blair is paying to use the Florida home of the Bee Gees singer Robin Gibb, Downing Street has said. The Prime Minister and members of his family are based at the $10m (£5.1m) Miami Beach mansion while on holiday. He has faced criticism for staying for free at the holiday homes of friends in the past but a spokesman said there was a "private commercial arrangement". The Blairs made donations to charity in lieu of payment for holidaying at the Barbados home of singer Cliff Richard. But his spokesman could not say whether a charitable donation was being made on this occasion. He also did not specify how much money is being paid or to whom. Downing Street does not normally comment on specific arrangements of the Prime Minister's holidays. The holiday began in a blaze of publicity when the British Airways flight carrying Mr Blair overran the main runway shortly after landing at Miami International Airport. Mr Gibb was seen in public with Mr Blair at a Labour rally in May 2005, ahead of the general election. The singer launched that Huddersfield event and Mr Blair described him as one of his heroes.